Presently I heard a slight groan, and I knew it was the groan of mortal terror. It was not a groan of pain or of grief –oh, no! –it was the low stifled sound that arises from the bottom of the soul when overcharged with awe. I knew the sound well. Many a night, just at midnight, when all the world slept, it has welled up from my own bosom, deepening, with its dreadful echo, the terrors that distracted me. I say I knew it well. Yes, he had been trying to comfort himself with these suppositions: but he had found all in vain. All in vain; because Death, in approaching him had stalked with his black shadow before him, and enveloped the victim. And it was the mournful influence of the unperceived shadow that caused him to feel –although he neither saw nor heard –to feel the presence of my head within the room. 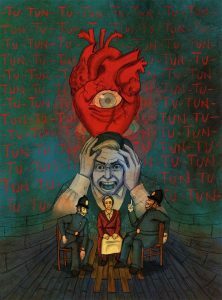 ‘The Tell Tale Heart’ narrates the tale of a man trapped inside his own head and then going on to rationalize his irrational behavior. The eye is a symbol for the facing of his own insanity in front of him and that is why the man does not like it when he sees that eye hovering around him for eternity. The narrator describes himself as ‘dreadfully nervous’, which causes him to be over-sensitive to all things in heaven, hell and earth that other people are not even aware of. This over-sensitivity causes him to murder the old man. The low, dull sound that he hears is actually the sound of his own heartbeat pounding in his ears with the pressure of revelation. This causes him to break down and reveal to the police that he murdered the old man.